"The reason that we have so many myths associated with Thanksgiving is that it is an invented tradition. It doesn't originate in any one event. It is based on the New England puritan Thanksgiving, which is a religious Thanksgiving, and the traditional harvest celebrations of England and New England and maybe other ideas like commemorating the pilgrims. All of these have been gathered together and transformed into something different from the original parts." If you've grown up in the United States, undoubtedly you've experienced the euphoria of the Thanksgiving meal and celebration. Just like Christmas, it can be an amazing and joyous time with family and good food. Most likely you were taught that Thanksgiving was started by the “Pilgrims”, some of the first settlers to America. The traditional story begins with a treacherous Atlantic crossing on the Mayflower, and after the Pilgrims landed, they were helped by local Indians. 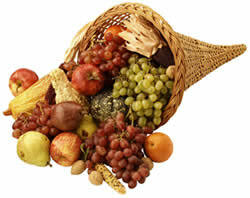 Then later, after a good harvest, the Pilgrims invited the Indians to the first Thanksgiving. The problem with the traditional Thanksgiving story is that it's a myth. The primary myth being that the Pilgrims started Thanksgiving. A dozen years ago the history of Thanksgiving was most likely explained as a meal with the Pilgrims and Indians eating turkey. But times have changed, there has been a shift in historical perspective because a vast amount of information that was once very difficult to find or access has only recently been made easily available to all historians. Sometime in the last 90's the FBI analyzed old government documents with modern forensic scanning equipment that revealed new information about Thanksgiving. In 2001, National Geographic along with the Plymouth Plantation Museum in Massachusetts created the most accurate reenactment of the “first thanksgiving” ever achieved, and in doing so has helped enlightened modern historians as to what really happened. Google has scanned many thousands of books, periodicals and newspapers from hundreds of years ago and the Library of Congress has put thousands of documents online. Hundreds of thousands more books and documents will be scanned and made available to us in the near future, and this trend is not slowing down. This paper is about exploring the real facts of history. Facts that many historians in the last ten years have already come to find and report on, but these updated views have not yet gained mainstream public knowledge. The facts that will be presented in this paper can be summed up simply, the traditional American Thanksgiving Day holiday is based almost entirely on myths, pagan traditions and a mix of social and religious festivals. This can be proved with a complete and honest look at readily available historical sources.